The Tacoma-Olympia Section of the American Society of Civil Engineers (ASCE) was chartered in 1930. The section provides support to approximately 450 local members and maintains a larger distribution list for sister organizations, neighbor sections, and other professionals who maintain ties to the section. We send out a monthly newsletter to keep our readers abreast of current events and activities. We have a monthly section meeting in the form of a presentation, training, or a social, except during the summer recess. During the summer recess, we have informal gatherings. Our Younger Members Group is also active and schedules its own programming. The section maintains close ties with the St. Martin’s University Student Chapter of ASCE as well. The section’s approximate geographic borders encompass everything south from the Pierce-King County border, west to the coast (excluding Bremerton), east to the mountains, and south to the Washington-Oregon border. The majority of our membership is concentrated in the Tacoma and Olympia metropolitan areas, but we strive to have representation from our more wayward locations when possible. We are part of Region 8 of the Society which encompasses Alaska, Hawaii, Washington, Oregon, Idaho, Montana, Nevada, Utah, and Arizona. 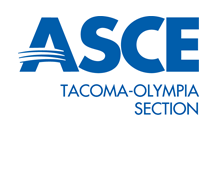 Although the Tacoma-Olympia Section represents the southwest portion of Washington State in membership, we maintain close ties to our neighboring ASCE sections and branches. We also work closely with nearby chapters of other professional societies such as the Society of American Military Engineers and the Structural Engineers Association of Washington. We hold joint meetings with nearby sections and societies on a regular basis. The Tacoma-Olympia Section’s officer positions rotate on an annual basis. Positions on the board are typically elected in our annual October elections, but may be appointed by an existing board from time to time when circumstances allow. The section also maintains standing committees which are chaired by volunteers. In addition, the section allows for the formation of task committees at the will of interested members. We are always on the lookout for dedicated individuals to fill volunteer positions with the section. If you are interested in a position, contact a board member.